Easy Care Linen Mix Trousers Regular is rated 4.8 out of 5 by 12. Soft linen mix fabric. Back elasticated waist with flat front. Drawcord and two front slant pockets. Easy to wear pull on style. Regular - to fit inside 29in/74cm. Rated 5 out of 5 by munchie63 from Lovely quality Great to wear and really lovely quality. Will buy another pair in another colour! 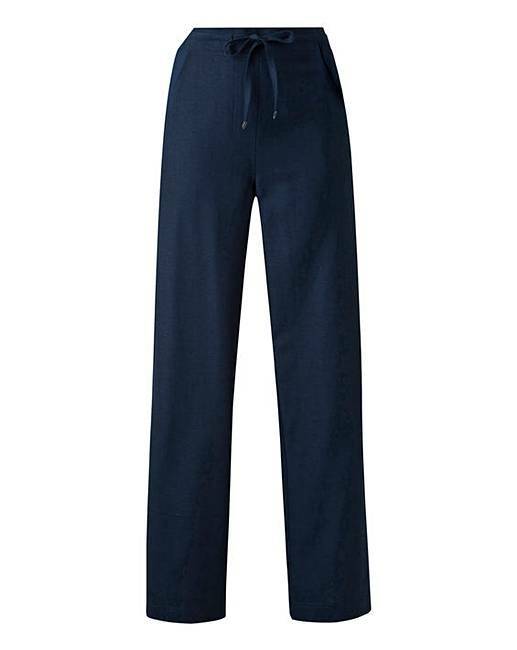 Rated 5 out of 5 by Buster123 from Comfy and practical Great trousers perfect for work or casual wear. Wash well. Rated 5 out of 5 by Jenny wren from Excellent fit Really nice trousers. Easy to pull on and easy to wear. Really comfortable. Rated 5 out of 5 by Divafever from Lovely quality These trousers are gorgeous - lovely soft material, lovely fit and look great!! Rated 5 out of 5 by Alan from Leggings These are so comfortable and really cheap for what they are. They are so light and fit perfect.